Life is a soap opera, especially for Elle Miller, who is a TV producer. (Ellen dropped the “n” in her name in hopes of finding a better ending for herself.) When her laptop crashes, she borrows her dead dad’s computer and gets way more than she bargained for. As Elle tries to save her career with a storyline featuring a trip through Atlantis, she takes a trip to the Emmys, and finds herself in the middle of a romance between a real doctor and a hunk who just plays one on TV. Friends, family, and clues from “the other side” all help Elle figure out the difference between living the good life . . . and living a good life. Dee DeTarsio is a graduate of The Ohio State University and lives in southern California with her family. She did not teach herself to read at an early age or write stories by the time she was in kindergarten. She was still wetting the bed and playing in the can cupboard. What most guys don’t know, is that women’s fiction has a lot on offer. I don’t think I’m being presumptuous about the reading habits of XYs. My husband (who has earned his title of “beditor”) wouldn’t be caught dead reading *girl* stuff, unless I convince him otherwise. It’s not like men are from Jupiter, that’s why they’re stupider . . . (though if the planet fits!) This is just an open invitation to those he-men of the universe to take a ride on the chick slide. (That sounds dirty but maybe it will help attract their attention.) There are so many smart, fun women writers, it would be great if guys would read it and weep. For extra relationship-bonus points, they can share their feelings in a bedtime book report! And they all lived happily ever after . . . 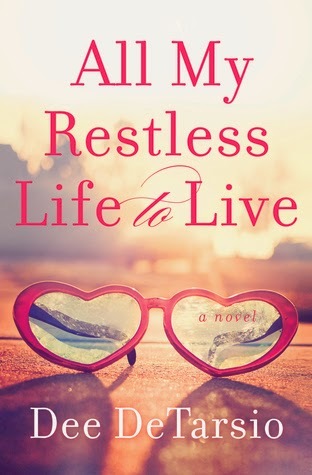 Thank you so much for featuring All My Restless Life to Live! I hope your readers have fun with it! Take care and have a great weekend! You're welcome!!! Thanks for stopping by!